The FloPro-Tracker was developed by Global FIA to meet needs expressed by Chemical Oceanographers. It is intended to be a portable system for carrying out tried and tested wet chemical assays. It makes use of Zone Fluidics to carry out sample preparation steps followed by wet chemical analysis. an Intel NUC embedded computer which is mounted on each of the FloPro Analyzers. 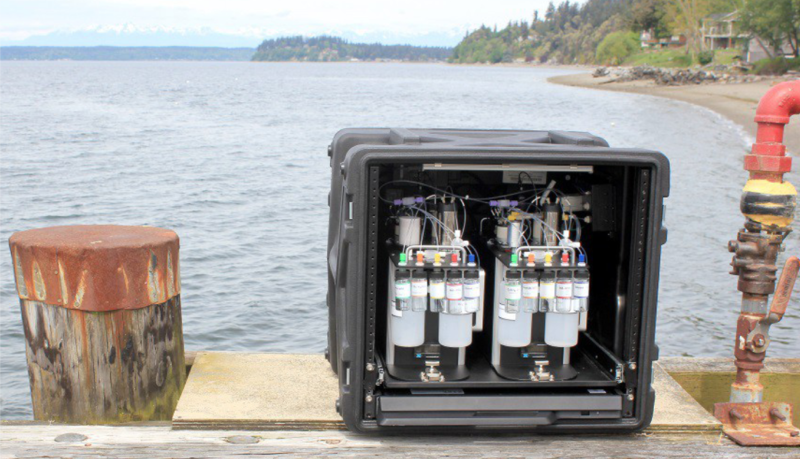 GPS receivers installed on each FloPro provide the geographical location of the device during sampling and measurement. In the early days of FIA, the most fertile repository of manifold components was the Chromatographer's laboratory. Since those early days, a whole suite of custom components have been developed for those practicing flow-based analysis. These components are now available commercially as stocked items. Global FIA provides a single source for many of the components needed to equip and maintain a flow-based analysis laboratory. A wide range of flow cells (included heated flow cells) and detectors such as photometric (uv and vis), chemiluminescence, fluorescence, amperometric, and potentiometric devices. All of these devices are available in the Global FIA store.